Skin Drop’s Advanced Retinol Complex is currently our top choice among all the different retinol creams we’ve tried over the years. Both the short- and long-term results we saw with this were truly amazing (which is rare in a non-prescription retinol product). After using it for a few weeks, we noticed it minimized crow’s feet and even some fine lines. It also did a tremendous job fading old acne scars and discoloration. Overall, it just made our skin look clearer and smoother than it had in years. This one has a 1% concentration of real retinol (very different from what many other products use) as well as some unique skin soothers like Snow Algae and Kelp Extract. Whatever it is, we can’t argue with the results! In addition to how well it works, it’s very affordable, easy to use and has an awesome guarantee. So overall we think Skin Drop’s retinol cream will appeal to the vast majority of people who use it. It really is that good. Skin Drop’s retinol cream is an off-white colored cream. It feels extremely light and airy on the skin. And immediately leaves your skin feeling smooth. Like most of the best retinol creams we’ve used, this one is a breeze to apply. It comes in a “pump” bottle, so it’s easy to just pump out how much you need. The instructions say to start with once application a week, which makes sense based on how potent and effective this product is (more on that in a minute). Once your skin has gotten used to it, you can use it more frequently. One important consideration– this product contains “real” retinol, so it works much better than those products that use a weaker derivative (like many of the “unknown brands” sold on Amazon). So you’ll want to start slow and gradually build up to everyday usage. Advanced Retinol Complex dries within just a few seconds, which is very fast compared to others we’ve tried. Because it’s a lightweight lotion, it doesn’t feel sticky and you’ll barely notice you have it on once it dries. The natural scent is very light and pleasant. To us, it smells like a day at the spa! And for those of you who don’t like fragrance, we noticed the smell had completely disappeared after a few minutes. We really liked the results we saw with this after just a few weeks. Our skin felt a little tighter and looked smoother. After the first week, we did get a bit of irritation which is completely normal and something we like to see. Anyway, this irritation subsided after a few weeks after which we began using it more frequently. While our short term results were great, we started getting VERY noticeable results after about 5 weeks. In fact, Skin Drop produced the best results of all the retinol creams we’ve tried over the years (and that includes some brands that charge over $100 an ounce)! So what exactly did we notice? First, our skin was just a lot smoother overall with better tone. Crow’s feet and fine lines in particular were noticeably reduced. The other big change we noticed was how clear our skin became. Old acne scars, age spots and discoloration were definitely less noticeable after using this cream (and it even got rid of acne for some of the testers). **Side note** Some of the girls in the office who were testing it decided to keep using it after the testing period was over. That’s a heck of an endorsement! The concentration of retinol is listed as 1% in the Skin Drop Advanced Retinol Complex formula. On their website, they talk about using “real” retinol versus weaker alternatives that other companies use. Based on the results we saw, I’d say that’s true. Some skin care companies have “watered down” their retinol concentration and ingredients to try and reduce irritation (and increase profits). While that might be great for marketing, the truth of the matter is you just won’t get the amazing results retinol provides without some “re-surfacing” of the top layer of skin. And that means you’ll usually get some irritation when you first start using these products. In addition to retinol, Skin Drop also includes a few “cosmeceuticals” that help condition and moisturize the skin (very helpful when using retinol to reduce some of that inevitable irritation you might get). These include things like Snow Algae, Kelp, Birch Bark Extract, Argan Oil and Shea Butter among others. 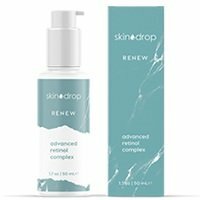 Skin Drop Advanced Retinol Complex costs $39.95 for a 1.7 ounce bottle. That works out to about $23.50 an ounce, which is one of the better values among our top 10 retinol creams (especially considering how well it works). Skin Drop offers a 90-day, 100% moneyback guarantee, which is one of the best we’ve seen. Even better, you don’t have to call them, get an RMA number or jump through any hoops. These are the kinds of guarantees we LOVE! To buy Skin Drop Advanced Retinol Complex, click here.